From the earliest grades, our Religious School sets the foundation for our students to have the knowledge and drive to be active participants in social action and social justice throughout their lives. 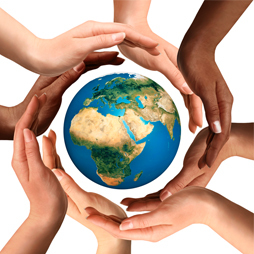 We build children’s social responsibility by teaching the concepts of TIKKUN OLAM (repairing the world), TZEDAKA (justice) and MITZVAH (commandment). According to our tradition, “Tzedakah is equally important as all the other mitzvot put together,” (Baba Batra 9a). Throughout the school year, our students collect Tzedakah. At the end of the year, classes collectively choose where to donate the money they have amassed. Past donations include supporting Magen David Adom, Israel’s national emergency medical, disaster, ambulance and blood bank service, or purchasing animals through Heifer International, an organization that gifts animals to communities in need. Our K-3rd-grade students create Tzedakah boxes to take home so that they can uphold the value of tzedakah even when not at Temple Isaiah. 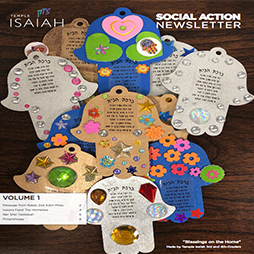 Please browse our Social Action Newsletter focusing on the Religious school. • 7th and 8th Grade participating in Art & Activism in which they pick an organization and create public service videos, using art as a tool for change. • 9th Grade Philanthropy Club which analyzes different non-profits, ultimately donating a generous $3,500 to the organization of their choosing. Our students will have the opportunity to learn about food deserts and food injustices in Los Angeles through the experience, of growing, eating and making food. Our students will learn about Social Enterprises and Non–Profits by shopping at thrift shops and meeting the people who work at the non-profit's headquarters. Our students will visit various non-profits and social enterprises that work with children and adults with varying special needs. Ending the day by working alongside special needs adults while helping them sell their products on Venice Beach. Our students will eat at a restaurant owned by refugees and hear the owner’s story, meet DACA recipients and meet organizations doing work to help the immigrants and refugees in our country, have an encounter with an ICE agent. Time: Leaving Temple Isaiah at 9:30 am (sharp) and returning around 2:30 p.m.
Each trip has limited space for 30 students so that registration will be on a first come, first serve basis. You will need to register for each trip no later than one week before the field trip. Please do not let the cost of the trips be a reason your child does not attend, if you have any need for scholarship, please contact the education team in the religious school office. The Family Philanthropy Club (FPC) was born out of the desire to help Temple Isaiah families engage in deep, meaningful and sustainable partnerships with non-profit organizations concerned with a variety of issues facing Los Angeles, including, but not limited to, hunger, homelessness, child and teen welfare and sustainability. The ultimate goal of the FPC is to establish deep connections between communities that are close geographically but are worlds apart economically, socially and religiously, to open our children’s hearts and minds to issues and struggles beyond their backyard, and to provide a forum for Temple Isaiah families to do this work together. The FPC will have a number volunteer events check out their page for more information. We hope to see you at an FPC event soon!